I’ve always thought you can tell a lot about someone’s attitude to dress by what goes on behind closed doors. We can all put on a good display in public, but when no one’s looking that’s when we learn the truth. As the poet John Keats said; “Whenever I find myself vaporish, I rouse myself, wash and put on a clean shirt, brush my hair and clothes, tie my shoestrings neatly, and in fact Adonisize as if I were going out – then all clean and comfortable I sit back down to write”. No matter what I’m doing and where I am I always strive to make my best appearance; and like Keats feel better for doing so. For example, I’ve always thought the idea of sleeping naked abhorrent; even boxers and T leave me unenthused. Going to bed in a set of Derek Rose, whatever others may think, I’m content in the knowledge that should I expire in the course of the night I won’t be meeting my maker tackle out. My other bugbear is having to pad around indoors in socks – and I can’t abide receiving guests as such. This is almost certainly a throwback to my childhood – ours was one of those dreaded shoes off households. I consider it one of the great joys of running my own house that I can keep my footwear on indoors. Of course this isn’t always the most practical thing, or the most comfortable. For this reason, much to the amusement of all my friends, for the last ten years I’ve sported velvet slippers. Revived recently by Ralph Lauren, I personally won’t dream of wearing them outside of the house in some OTT preppy statement – saying that I have taken to wearing during flights. But for me they’re principally a home comfort. Often referred to as the Albert (after Queen Victoria’s consort) they are not so much a slipper as house shoe, and are considered acceptable footwear for Black Tie. Indeed for the English they are the predecessor to the loafer, or rather its acceptability. Enjoying something of a revival, even the likes of Prada have added them to their collection. Personally, I would stick to Tricker’s (who make their own, with leather lining); Shipton & Heneage (for variety and quilted lining), Heraldic Needlepoint (Regimental Stripes) or Broadlands Slippers (exceptional pricing). And should you feel that such things might appear effeminate, behind closed doors whose business is it but yours. I would like to say that I found this article rather refreshing. I too can not bring myself to sleep without pyjamas. Derek Rose are also a favourite of mine. My local John Lewis had them at half price recently, so I obviously indulged myself. I’ve wanted some for a while, but I can’t decide whether or not to have anything embroidered on them. 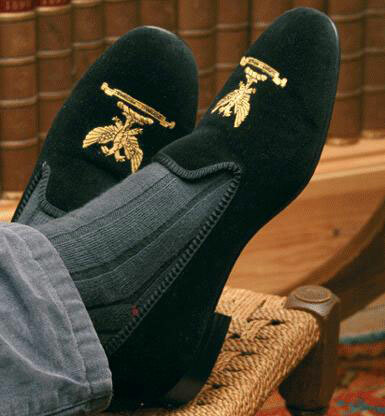 On the one hand, it seems like an integral part of this style of slipper to have a crest or monogram on the front… on the other hand I have a feeling it’s pretty hard to wear anything like that unless you have either a healthy sense of irony or a vast country estate. Mind if I ask what, if anything, you have on yours? One pair are a plain green velvet, where as my second are rather like these.. I would go plain, a simple pair of blacks are on balance the most elegant. I hope that in some way helps. For some reason my earlier comments haven’t appeared. So trying again. One pair are plain green velvet, while the other pair are black with a cheetah along the side and across the front. Some might regard that as poor taste, but I don’t care. I advise you pick something that suits your personality or is significant to you. Failing that the plain black is elegent simplicity. haha, i’m the complete opposite. Cannot sleep with anything on. If it’s cold i’d rather have 3 duvets than wear PJs. The best thing about living in one’s own house is being able to walk around naked!